When we were in Toronto visiting our daughter before she was married we went to the Toronto Islands. 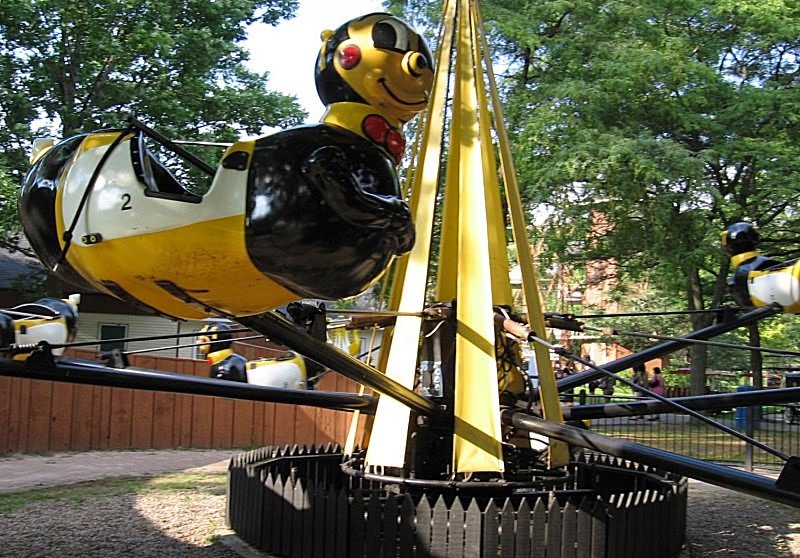 On one of the islands is a small amusement park that caters mainly to kids called "Centreville Amusement Park". I had to photograph as many of the rides as possible. These jolly "Bumble Bees" rise and fall as they go around. 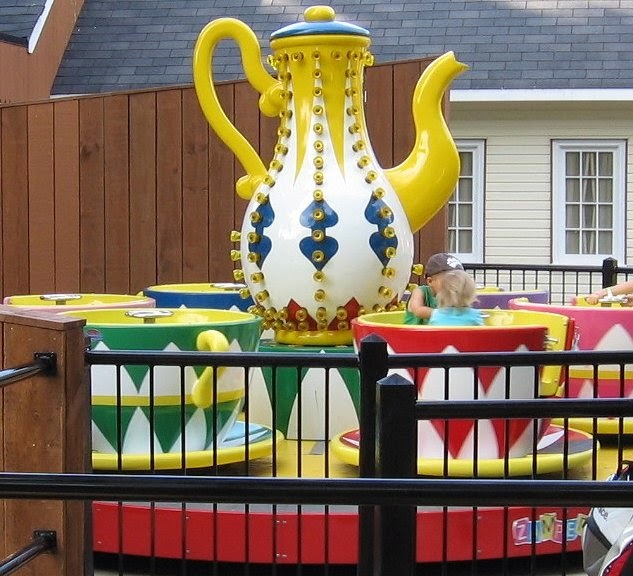 This teacup ride was new at the park. I like the bright colours and that teapot would look great in the early evening lit up. The bold simple forms of the teacups is very appealing. I understand why Michael Jackson wanted the midway rides in Neverland, they are beautiful sculptural forms as well as lots of fun. This is an antique 1907 carousel. Horses are nice but that pig and the rabbit are much more interesting. Here is a better look at the rabbit and yes, the pigs bottom! The quality of the carving of the antique carousel animals is superb. 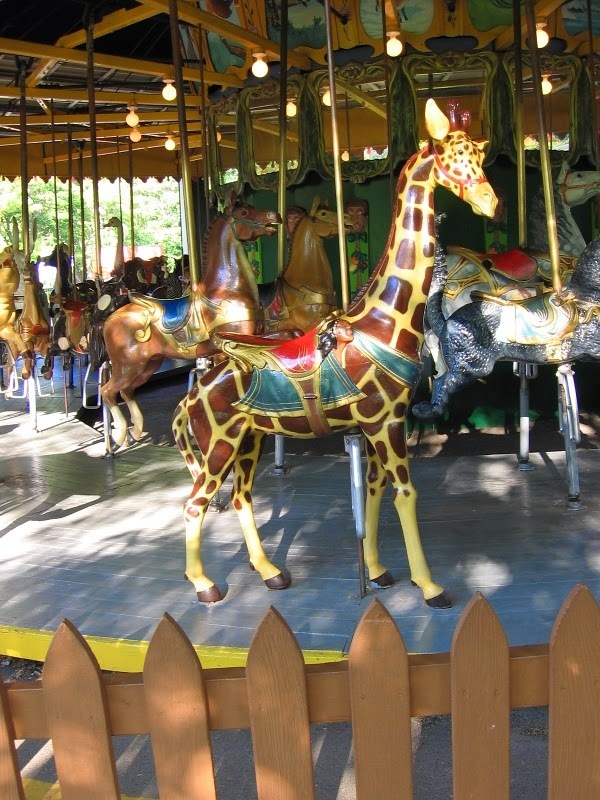 The men that carved the carousel figures and the other areas on the rides at the factories were master craftsmen. This horse is pulling a chariot that you can just see behind him, but those ostriches look more interesting. This is the regal chariot that the previous horse is pulling. In amongst the horses are two cats, a white one with black socks and a marmalade coloured cat, each with a fish in its mouth. This grey cat has a tasty fish in his mouth as well. Carousel animals are very diplomatic when it comes to size, not one animal is bigger or smaller than the other. They realize that they are there to carry and entertain their human passengers. Giraffes are the same size as a horse or a cat or a rabbit or a pig. All is happiness on the carousel. A very happy boar. He knows that the tiger beside him is putting on a fierce show for his human riders. Who would want to ride a horse when you can ride a fierce roaring tiger! There were other rides but I did not get any pictures of them. We were on our way to the ferry back to downtown Toronto and I didn't want to annoy anyone with my obsessing over the rides. We had a wonderful day.